Mary Jane Mayemura never spoke during the annual Memorial Day tribute to fallen Japanese American soldiers, including her son Jimmie. She didn’t have to. 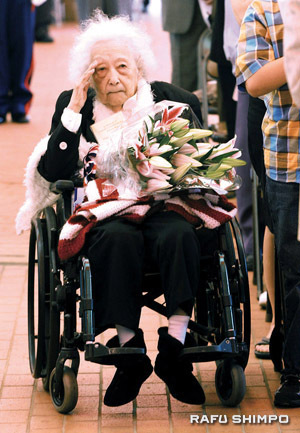 Her presence every year at the ceremony held at the Japanese American War Memorial Court in Little Tokyo, until her passing at age 97 in 2010, spoke volumes. I was thinking of Mrs. Mayemura as Republican presidential candidate Donald Trump heaped scorn and abuse over the weekend on the parents of Capt. Humayun Khan, particularly his mother Ghazala, who stood silently as her husband addressed the Democratic National Convention. Ghazala and Khizr Khan lost their son, Army Capt. Humayun Khan, just 27, when he was killed by a suicide bomber in Iraq in 2004. 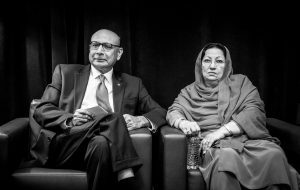 What Khizr Khan said at the DNC was a powerful affirmation of the basic rights of Muslim Americans, whose very existence here in the United States has been questioned by Trump and his “Make America Great Again” crowd. The Japanese American community still bears the scars that are the tragic result of this kind of hateful divisiveness. “Like many immigrants, we came to this country empty-handed. We believed in American democracy — that with hard work and the goodness of this country, we could share in and contribute to its blessings,” Khan said. Those same words could have been spoken more than 70 years ago in arid concentration camps by citizens of Japanese ancestry imprisoned by their own government in a climate of xenophobia and wartime hysteria. It is unfathomable to imagine the grief of those Gold Star mothers receiving the news of their fallen sons in places like Manzanar, Amache, Jerome and Heart Mountain. For Japanese and Muslim Americans, the proof of patriotism has been written in the blood of the sons who will never come home, the grandchildren that will never be born. To lose a child is to lose the future. Ghazala Khan and Mary Jane Mayemura are separated by decades, but a mother’s love is universal and inviolate. They have taken it as their duty — one that no mother would ever wish for — to make sure that their sons’ sacrifices are not forgotten. A Rohwer internee, Mayemura lost her only son, Jimmie, an Army infantryman, on Nov. 4, 1951 in North Korea. His one-year memorial service was held at Nishi Hongwanji, and she asked her son’s friends to wear their Army uniforms. Decades later, Mrs. Mayemura would stoically lead the procession of grieving families. The last time, the matriarch offered a salute as her wheelchair was taken to place flowers by her son’s name at the Memorial Court at the JACCC Plaza. Ghazala’s silence last Thursday spoke so eloquently of a mother’s loss and her loving support for her husband. That Donald Trump couldn’t understand that shows a disturbing flaw in his character. “His wife, if you look at his wife, she was standing there. She had nothing to say. She probably, maybe she wasn’t allowed to have anything to say,” Trump said on Friday. This Gold Star mother said plenty, Mr. Trump. You just don’t have the compassion or decency to listen. Sometimes, the most powerful and most meaningful statements are those made without words. True leadership not only understands this, but embraces and respects it as well. I think it’s really interesting that you are assuming our grandmother would be against Trump! Well you couldn’t be more wrong! What she would absolutely be against is the liberal agenda of constant race baiting or being handed free handouts without working for it. Her family suffered tremendous losses being in the internment camps, yet loved America so much, even after losing EVERYTHING, that her only son voluntarily enlisted and lost his life heroically in the Korean War. The way the country is disrespecting the Anthem, LEGAL IMMIGRANTS and our military, I guarantee grandma Mayemura would be appalled by the displays of the liberal agenda. Btw, she was NOT a Clinton supporter and found him and his wife disgusting liars! I am completely disgusted in finding this article and how you’ve twisted our beliefs, to promote your own agenda. I’m sickened to even think of attending another memorial service. Your credibility to us is now meaningless and empty. How dare you!